Gracing us with his ferocity, glory, and cuteness descends TAY’s lord and savior to bestow upon us a cooking logo. This day marks the beginning of a new era... OF FOOD! BEHOLD HIS POWER! Many people have been poking and prodding me about coming up with a ‘Cooking with TAY’ logo, so I began to sketch a few ideas. 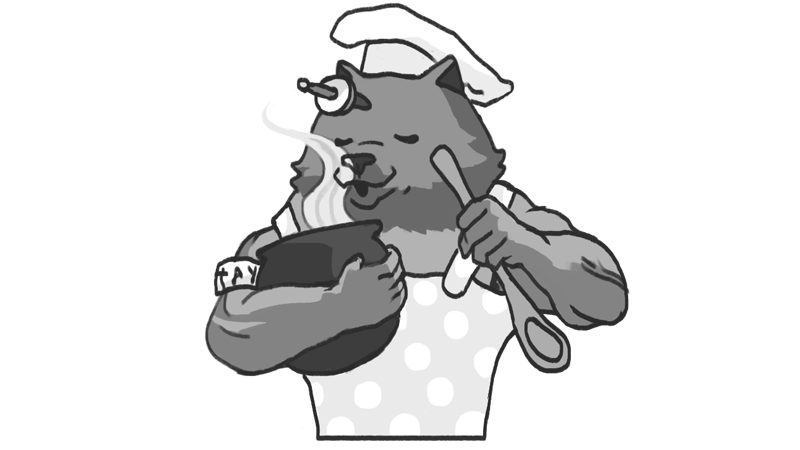 Initially, I wanted to base it off of the Bear God that Bonny so graciously provided us with, but then I decided it might be funnier to just have a bear cooking. I’ve never drawn fur before. It wasn’t quite coming out how I wanted it, things weren’t looking good, and most importantly: the finer-details wouldn’t scale down well. SO, I decided to try and enlist the aid of the master himself: Bonny John, to teach me how-to-fur. When I mentioned the concept, however, he really took it in and said he’d be interested in taking it up himself. There were a couple of things I was looking to add, so we got to talking and he drew out a concept as we were going through them. Initially, I wanted to add some kind of surface below the pot, but being the definition of strength, why not just have him hold the pot in his grizzly arms? Being a master chef, we also decided he had to have an apron. With polka-dots. Yeah. We also decided to go back to the bear god. I was going to write out a story, but... why do I need to? Bear gods have to eat. Bear gods have dreams. Don’t tell the bear god he can’t be a chef. and what we got in the end is what you see at the top in the header! Enjoy, everybody! I can’t wait to see what you all come up with! Huge thanks to Bonny for finishing this concept so-damn-awesomely. Really stunning work, as always.